James and I are huge fans of brinner. This hybrid of breakfast and dinner, brinner typically means we’re having bacon and eggs or breakfast tacos around 8 p.m.
One of the highlights of brinner for me is that typically it takes little to no effort to accomplish, and we’re always left feeling happy and full. I spotted this recipe for “Grandma Mack’s Breakfast Delight” on Sargento’s website, and I knew we’d be having it soon, and we’d definitely be having it in the evening hours. I’m not sure who Grandma Mack is, but I could kiss her. I really love how simple this casserole dish is, and the texture and flavors were not unlike the Panera Bread Soufflés I made last June. If you’re cooking breakfast (or brinner) for a crowd, Grandma Mack’s Breakfast Delight will definitely do what it says on the tin. 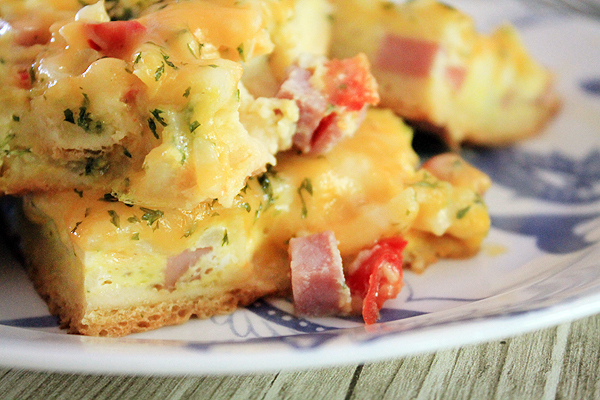 The fluffy eggs and deliciously bubbly cheddar jack on top are great on their own. But then you add that slightly crunchy, extra buttery crescent roll layer, and this is brinner perfection. Much like an omelet, Grandma Mack’s Breakfast Delight is customizable. I upped the ante by adding garlic and onion powder, fresh red pepper, and parsley. What would you add to make Grandma Mack’s recipe your own? Spray a 9″ x 13″ baking dish with cooking spray, then roll out the entire tube of crescent rolls and place it in the bottom of the dish. Do not tear the pieces apart – instead, pinch them together anywhere they seem to gap. Dice the ham steaks into 1/2″ x 1/2″ cubes and then spread them evenly over the crescent roll dough. Add an even layer of the frozen hash browns next. Follow with any additional toppings you fancy. We added fresh bell pepper to half the casserole because James is a fan, but I’m not. 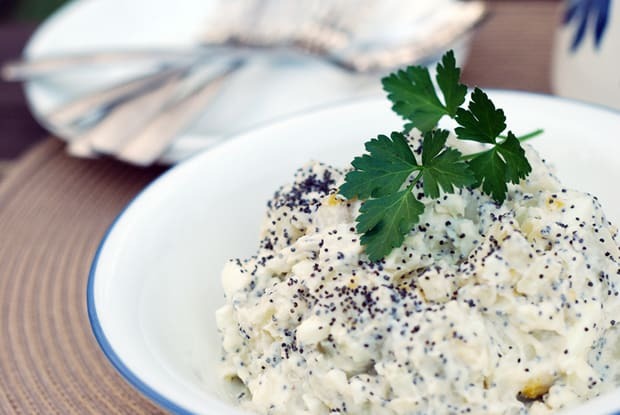 In a medium bowl, whisk together the eggs, milk, garlic powder, onion powder, salt and pepper until well beaten. Pour the egg mixture over the casserole. Top with Sargento Fancy Shredded Cheddar Jack Cheese, and then sprinkle parsley over the top. 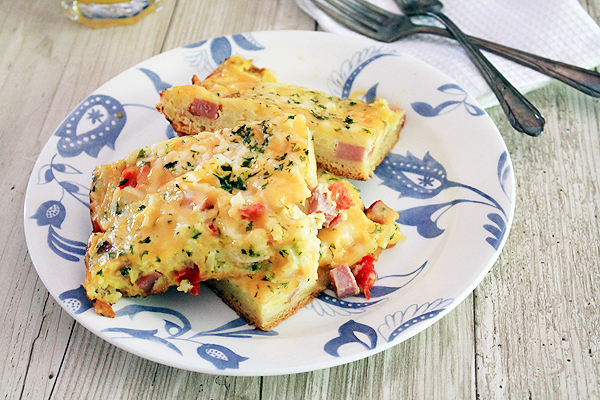 Bake for 40 minutes, until eggs have set, cheese is bubbly, and when sliced, there is no liquid in the casserole. Enjoy with orange juice, or a glass of white wine at brinner! what an awesome brinner! love it! We’ve been having our share of brinner lately, too! This looks like a winner… Yum! Anything that starts with crescent rolls is ok in my book. I have an unhealthy love affair with breakfast casseroles. I would add chopped green chilies! When I first clicked on this post I was expecting a sweet story about your Grandma! Haha! Nonetheless this looks like a great breakfast, brunch, or brinner option (our go to brinner is ham and egg sandwiches on English muffins or bagels)! Well, you know me – I’d use homemade dough and fresh potatoes instead of premade, but I’m right there with you on the brinner love. And brunch, too, when I can make it at home! It’s perfect except I’d switch the bell pepper to green chilies! Looks delicious! Good call, Callye! Wonder how this would be with some straight up salsa mixed in too. Mmmm I love brinner and this looks fabulous! Will have to make this asap!! Haha, isn’t that the truth? What is it about the word “delight” that makes you think of all those fabulous luncheons our grandmas used to throw? Looks yummy! I’d probably substitute turkey sausage for the ham and add some diced jalapeno or roasted green chile for some heat. Thanks for sharing! Sausage and jalapeno sound like a fabulous idea to me, Aimee!